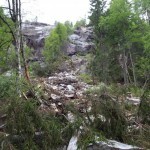 Quite recently there was a quite big rockslide in the mountains where Iive. 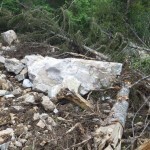 A lot of trees were killed and splintered by huge rocks thrashing down. I went up to have a look and it struck me what an enormous resource this kind of disturbance would give a person or group without metal tools. 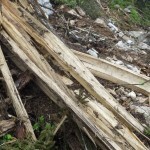 The splintered trees can relatively easily be made into skis, cutting boards, paddles, bows, arrows and a host of other useful items, which normally can require a lot of work with a stone chopping tool, sometimes even with a metal one. Many of the birches have had their bark broken open and ruined, but it is still usable for torches and firelighting. The occasional one is also good enough for crafts or thatching. The advantage is that you can skin the whole tree without felling it yourself first. 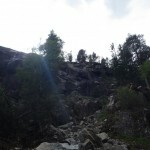 In some areas these rockslides will expose good tool-stone. In this case the stone seemed mostly usable for very crude tools. 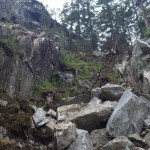 When the path of the slide starts to recover from the destruction, raspberries and hazel are likely to be colonizers along with herbs like dandelion. They will in time stabilize the slide and produce quite a bit of food due to the sunny and nutrient rich conditions. In my opinion, these kind of natural desturbances were virtually indispensable for stone age forest people who didn’t have good stone axes. For several years I have been experimenting quite a bit with burning of lands to add variation, stability and abundance. 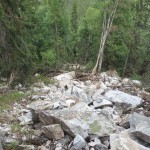 The results are still far from conclusive as several of the sites takes a number of years to recover from a burn. Some lessons can be drawn already though and I’m presenting these here. Burning blueberry undergrowth (or other brush berries), which makes for a substantial portion of the area here, seems to have less advantage unless there has been a mass death of the undergrowth. 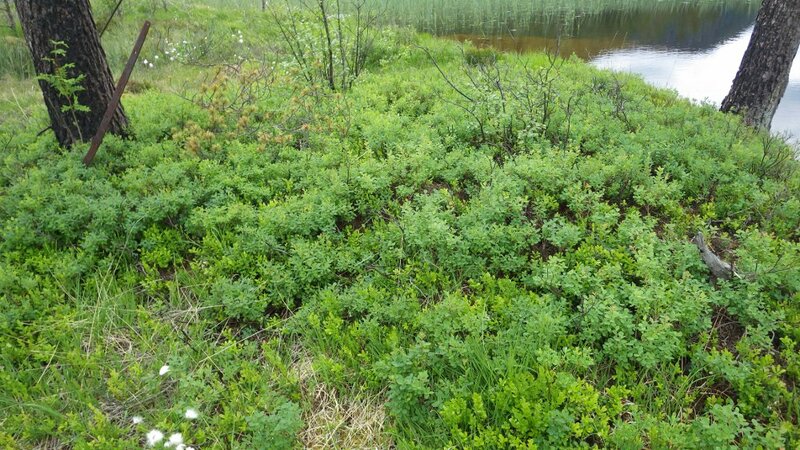 This happens with long intervals only, most places the bushes seem to produce steadily for 10-20 years before they die. At this time it might be beneficial to burn them in order to rejuvenate them. A fairly superficial burn seems to stimulate the roots of many species so that they’ll sprout very vigorously the next year. This seems to hold true for most grasses and decideous bushes and trees. Conifers are negatively affected, unless the tree is limbed to above the hight of the flames before you set fire to the ground. 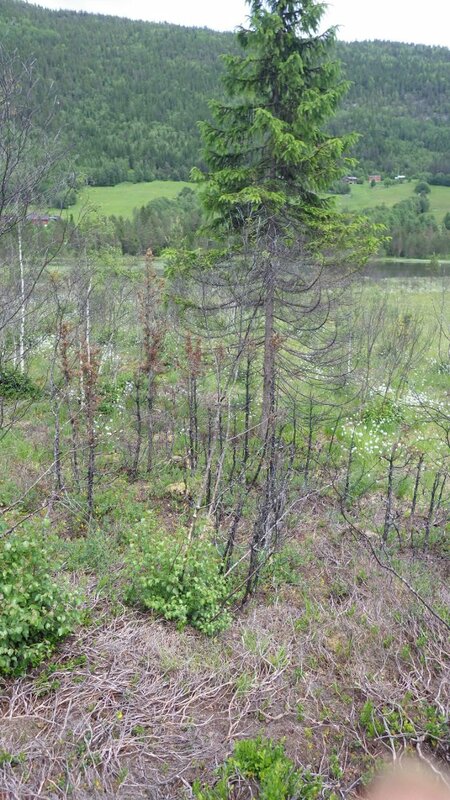 These pictures show patches of blueberry, bilberry and cowberry in different stages of regeneration after a burn. To my surprise, grassy areas on peat moss, doesn’t seem to be as positively affected by burning every year as I thought. The burning does kill the spaghnum moss, which increases the area where grass is produced, but the grass seems to be slow to colonize those new patches. 3 years of burning does not seem to be enough to have grass take over for the moss, but I’ll keep on burning a patch every year to see how it develops. Reason why I want the peat moss to shift to grass is to increase forage for herbivores. Peat moss is super abundant here in any case, so I want to shift the proportions to more grass. 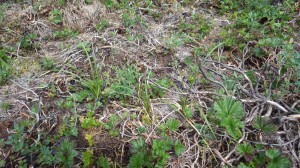 Very few species eat peat moss. Burning a patch every year, or even every few years will of course also keep trees from colonizing the patch, only grass and herbs will survive. This is the patch that has been burnt three years in a row (but not this spring). 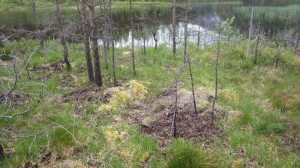 I set fire to several acres down by a lake last years, which killed off nearly all of the small birch in the area. 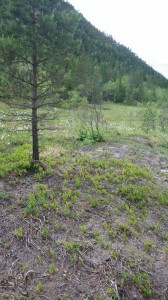 This way I caused a setback to the regrowth of beaver feed, which I regret, but on the positive side it killed off nearly all the small spruces and pines which would eventually have outcompeted the birches. 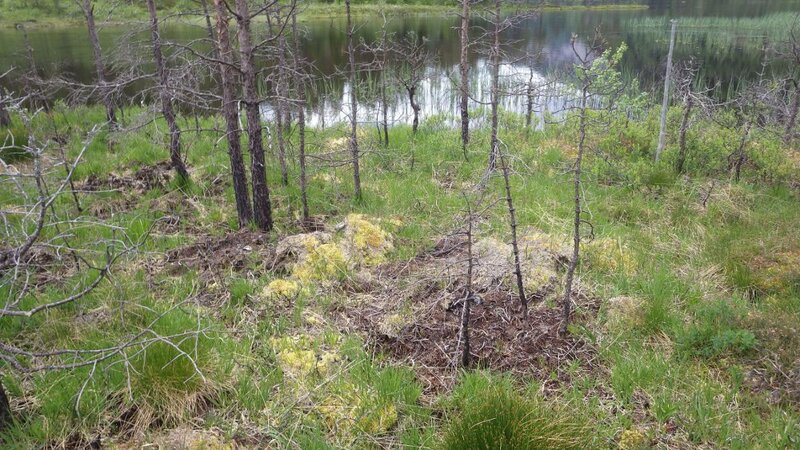 My lesson from this though is that I’ll only burn such an area only right after the beaver has logged there extensively to remove the leftovers from their work and to encourage regrowth. Game also avoid crowded, brancy places as there is not much food to find and walking there is a pain in the behind. 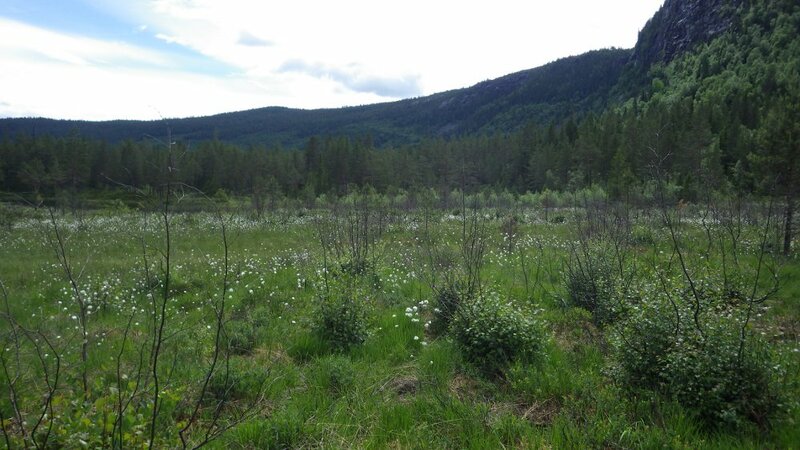 The most successful experiment has been in burning dry grass fields on a pretty large scale, and also inside forests with grass as the undergrowth. Dead grass is removed and the grass looks greener and grows thicker. 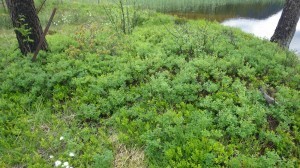 Cloudberry (Rubus chamaemorus). 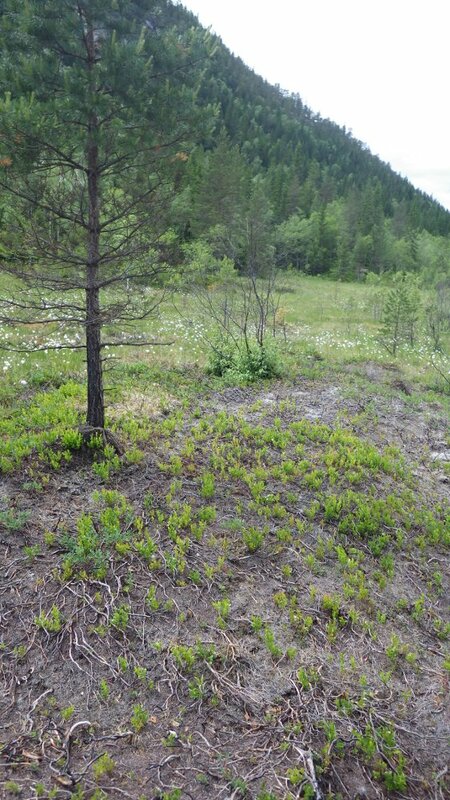 Seems to be positively affected if the burning is done only with very long intervals, since they seem to benefit from the reduction of peat moss and heather. Whether they produce more berries after burning, I have not yet been able to conclude upon. It is worth noting that fire killed trees makes for an excellent source of firewood and a large fire can provide you with an abundance for several years. The photo is a bad example, but gives you an idea. Woods I manage such as to always leave the biggest trees. Take the majority of the smallest trees and burn them in heaps, but leave the nicest ones. Use some of the medium sized trees for timber, especially spruce, which in abundance can cause intense shade in the undergrowth to the exclusion of groundcover production and other species of trees. 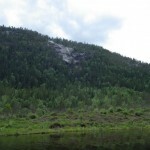 They also negatively affect the quality of the bark of birches. If several larger trees crowd a place I make decision based on whether there is a need for some cover for the animals there and if I need the timber. No matter how small in growth, I always clear around rarer species to promote variety. This goes also if I discover a patch of edible plants of any kind, I’ll make their conditions more favourable in any way I can. I also generally limb the trees to above my head to make it easier to move about, but leave some spruces unbranched here and there for game cover. The key is to allow for enough shade to keep young trees from developing in the undergrowth, while allowing enough light to keep grass, herbs and some brush growing in the undercover. This will make for the most productive and beautiful forest I believe. The worst thing you can do with a forest is to cut it all down at once and not follow it up. It will then take at least 3 times as long to get a nice, productive forest for you and the animals than if you tend it sporadically. 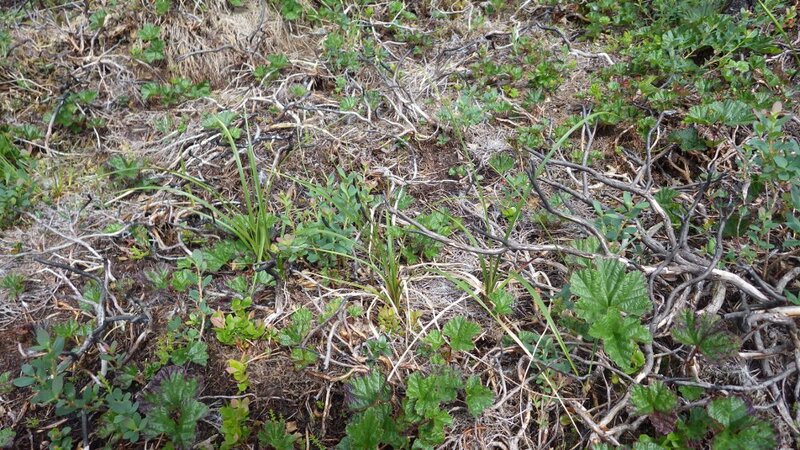 That said, variety should come in all aspects, so some places should be allowed to be thick and regenerate on their own. Some places should even be thick spruce forest. These habitats play crucial roles as cover for animals, but aren’t very productive and should because of this be limited in size and frequency.